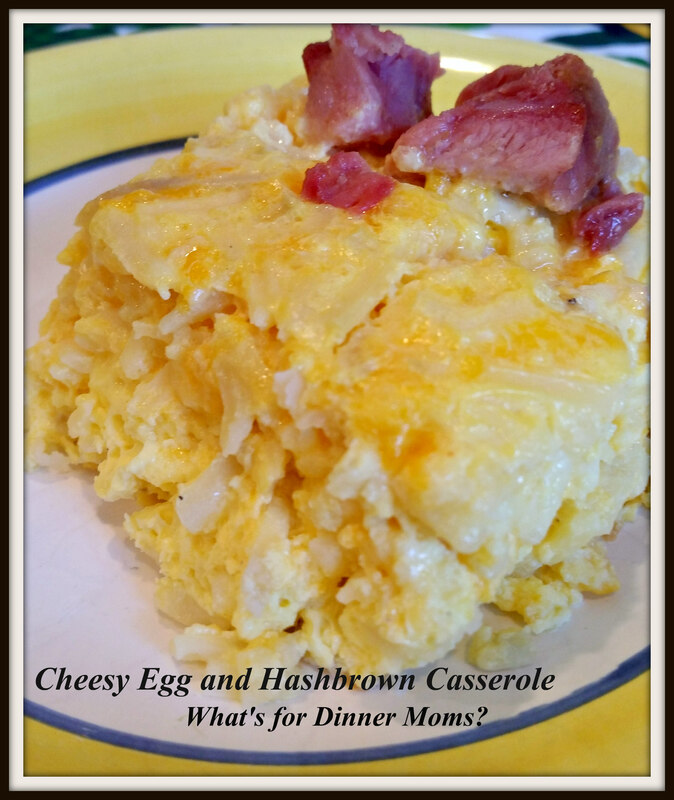 Cheesy Egg and Hashbrown Casserole – What's for Dinner Moms? Next to my slow cooker, casseroles are one of my favorite was to get dinner made simply and quickly. Many casseroles can be frozen or made the morning you wish to serve them. Cover and refrigerate until you arrive home and then just pop them in the oven! I love that the work is done and it just has to bake. Breakfast for dinner is always a fun treat. I usually try to schedule something simple for Thursday nights because that is one of our busy nights. I know that I don’t get home until 8:15 pm with my daughter from dance and my son and partner get home at 6:45 pm from Science Olympiad practices so dinner needs to be super simple for them to make. It doesn’t get much simpler than popping a casserole in the oven! This was a good basic casserole. We forgot to put the ham in the casserole so we just threw it on top to bake with the dish. The great thing with this casserole is you can customize it very easily. Next time I am going to saute some peppers and onions to add to it and maybe a bit of tomato! Add broccoli, change the cheese, or even pour salsa over the top when it is done. It is all up to you! your choice of mix-ins such as: 1 cup bacon (cooked crispy and drained), sauteed veggies such as onions, green peppers, red peppers, ham, Italian sausage (precooked and drained), garlic, tomatoes, etc…. Preheat oven to 350 degrees. Spray a 9 x 13 casserole dish with non-stick spray. Have your mix-ins prepared and cooked if needed before making casserole. Add milk, eggs, salt and pepper to a large bowl. Mix together well. Fold in cheese, hashbrowns and any mix-ins you have. Coat well with egg mixture. Pour mixture into prepared casserole dish. Bake 45-55 minutes until center is set and top is starting to brown slightly. Next Post Planning a Trip to Disney World Without Children! Thank you! You you are so kind! Thank you! Hope you male it your own by adding all sorts of great things in! Hash brown casseroles are da’ bomb! I love them myself too. So very versatile. Eggs and hashbrowns are probably my favorite breakfast foods, so I will for sure make this!